by Tim Weiner | Nonfiction | This book has not been rated. 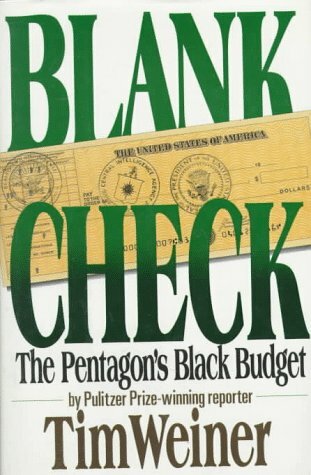 "Blank Check is the story of the Pentagon's secret budget--the black budget. A remarkable work of investigative reporting, this book presents the first detailed look into the multibillion-dollar cache used to fund every defense program, every espionage mission, every weapon, and every war that the President, the Secretary of Defense and the Director of the CIA want erased from the public ledger and shielded from public debate." The author is a Pulitzer Prize-winning reporter (again, according to the cover) but I couldn't tell you if he's an investigative genius or a conspiracy kook. The book was published in 1990, so I'd guess it's quite dated by now either way. My husband gave the book to me to pass on, as he never quite got into it.